A copy-cat recipe of Carrabba’s Italian Grill, this slow Cooker Sicilian Chicken Soup is a hearty comfort food Italian soup recipe for the fall and winter! 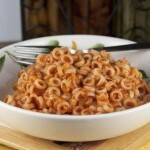 You will love it because it’s made right in the crock pot, loaded with vegetables and pasta! Have I got an amazing soup recipe for you today or what?! I took a week recently where I made nothing but soup for dinner every night of the week. I loved this Beef Nacho Soup! Mr. Wishes didn’t even seem to mind….or he was just being polite. 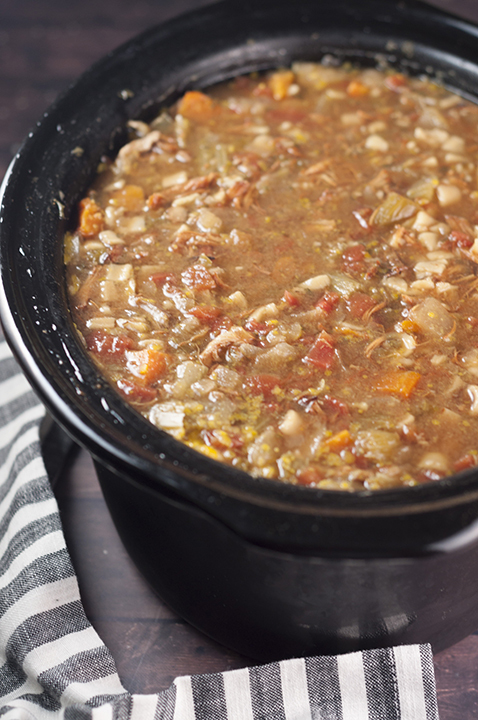 This Slow Cooker Sicilian Chicken Soup was one of my favorites of the week. The soup recipes on my blog always seem to be a hit with my readers so I’m trying to give the people what they want. The first time I had this soup was at Carrabba’s Italian restaurant a couple years back. I kept thinking about how easy it would be to recreate it at home so I could have it whenever I wanted. My love for soups with meat AND pasta in them runs deep. I found other recipes for this Sicilian Chicken Soup online, but most of them were made on the stovetop. I was wanting to recreate the soup but use my slow cooker to do it. 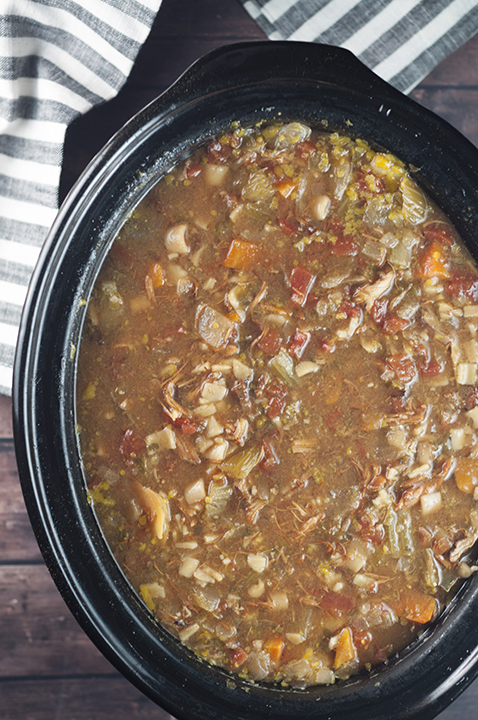 That’s how this Slow Cooker Sicilian Chicken Soup came about. My house smelled absolutely amazing all day while this cooked! That is the beauty of slow cooker and crock pot recipes. You get to smell your delicious dinner all day long (which sometimes can kind of be torture if you are hungry). It’s the gift that keeps on giving (in the words of Cousin Eddie from National Lampoon’s Christmas Vacation). This Slow Cooker Sicilian Chicken Soup will soon become a family favorite, especially if you are big soup fans. 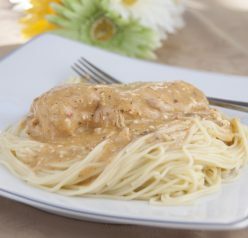 Serve it with some crusty Italian bread and a salad and you have yourself a delicious weeknight dinner or weekend lunch! You do not need to make a veggie on the side since this soup is packed with them. If you like more of a creamy soup with chicken and pasta, check out my Chicken Alfredo Tortellini soup. The broth for this soup is very thick and rich! If you prefer rice, my Chicken & Wild Rice Soup is where it’s at. You will also love this Chicken, Black Bean, and Cilantro Soup from my friend Kalyn. A copy-cat recipe of Carrabba’s Italian Grill, this slow Cooker Sicilian Chicken Soup is a hearty comfort food Italian soup recipe for the fall and winter! You will love it because it's made right in the crock pot, loaded with vegetables and pasta! Place the carrots, celery, potatoes, onion, garlic cloves and diced tomatoes (with juice) in the slow cooker/crock pot. Add in the chicken breasts and chicken stock. Mix well until everything is covered. Cook on low heat for 6-8 hours or high heat 3-4 hours (make sure chicken is cooked through). Cook pasta according to directions on package; drain, rinse and set aside. Remove the chicken breast, shred with two forks, place back in the crock pot with the soup. Serve soup in bowls and top with pasta (as much as each person wants). Enjoy! That does look good! 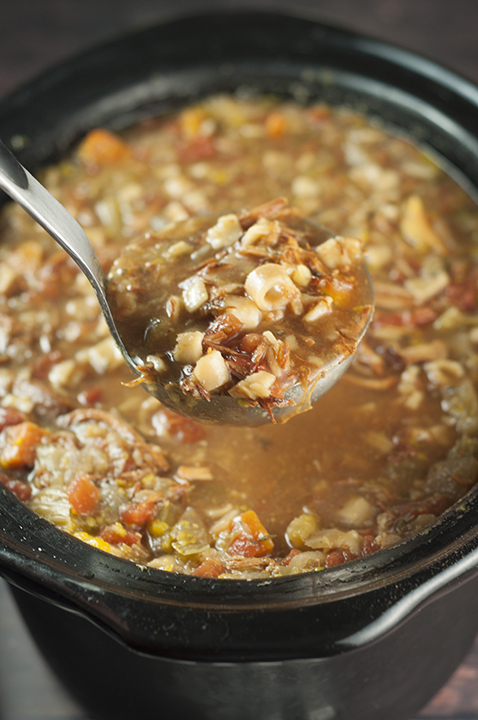 I love to make soup in the slow cooker to get the house smelling great! Thanks for the shout-out for my soup! Yum. What a great recipe for this time of year! It looks delicious. This looks so good. My family loves soups and I love my Crock Pot. 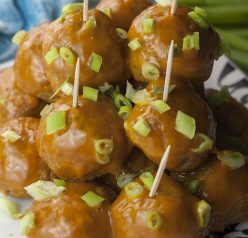 Thanks for sharing such an wonderful recipe! The look of this chicken soup is terrific. Thanks for the recipe Ashley. My crock-pot is ready! This soup would disappear in 10 minutes in our house. SOOOO good. Oh, my was this delicious! I’ll be making it all winter long! So perfect for this cold weather we are having! I have 2 kids, soup is usually on our meal. I saved it, cook it for family soon. Can I substitute pork for chicken? Many thanks. Yes, I’m sure that would taste great.